We build the Large Candy Cane With Bow and Bells in our workshop. 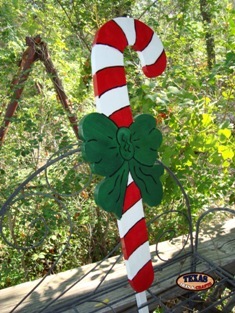 The arts and crafts candy cane is hand painted red and white with a green bow and gold bells. The candy cane's dimensions are approximately 34.75 inches tall by 11.75 inches wide by 1.50 inches deep. The candy cane has a 34 inch stake. The item weighs approximately 4.50 pounds with packaging. For the continental U.S. shipping and handling is included in the listed price. For shipping outside the continental U.S. please contact us through our Contact Us page. We build the Large Candy Cane With Flower in our workshop. 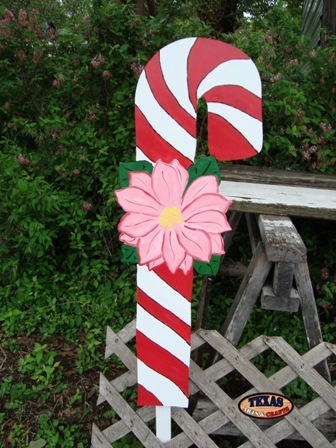 The arts and crafts candy cane is hand painted red and white with a green bow and a pink flower. 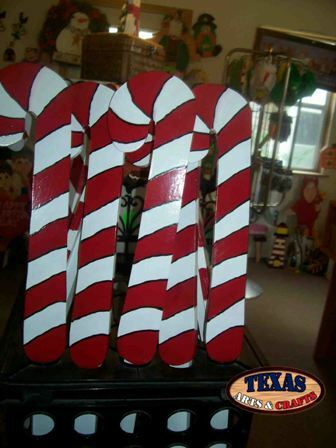 The candy cane's dimensions are approximately 34.75 inches tall by 13.50 inches wide by 1.50 inches deep. The candy cane has a 34 inch stake. The item weighs approximately 4 pounds with packaging. For the continental U.S. shipping and handling is included in the listed price. For shipping outside the continental U.S. please contact us through our Contact Us page. We build the Lollipops in our workshop. The arts and crafts item is hand painted red and white with a green bow. 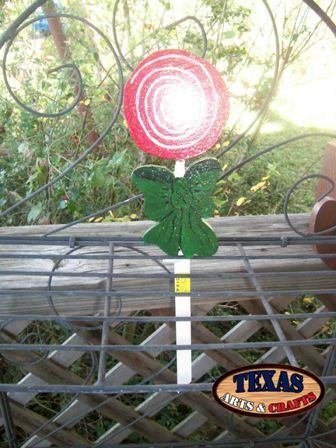 The lollipop's dimensions are approximately 16.50 inches tall by 4.50 inches wide by 1.25 inches deep. The combined dimensions are 16.50 inches tall by 4.50 inches wide by 3.75 inches deep. The lollipops weighs approximately 2.50 pounds with packaging. For the continental U.S. shipping and handling is included in the listed price. For shipping outside the continental U.S. please contact us through our Contact Us page. 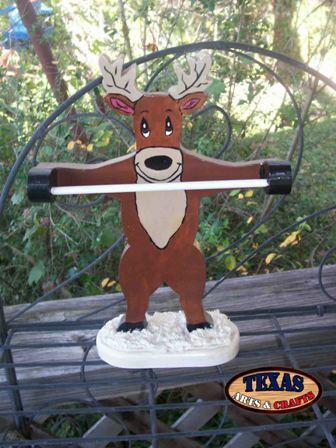 We build the Reindeer Candy Cane Holder out of pine in our workshop. The candy cane holder is hand painted brown and white. The dimensions are approximately 12 inches tall by 9.50 inches wide by 4 inches deep. The item weighs approximately 2 pounds with packaging. For the continental U.S. shipping and handling is included in the listed price. For shipping outside the continental U.S. please contact us through our Contact Us page. 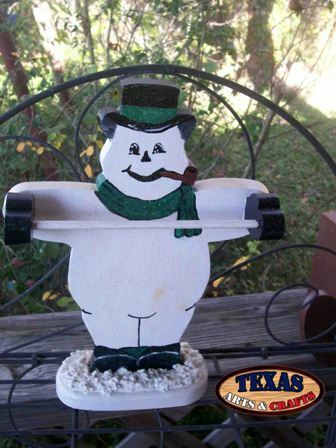 We build the Snowman Candy Cane Holder out of pine in our workshop. The candy cane holder is hand painted white, black and green. We build the Large Candy Cane in our workshop. 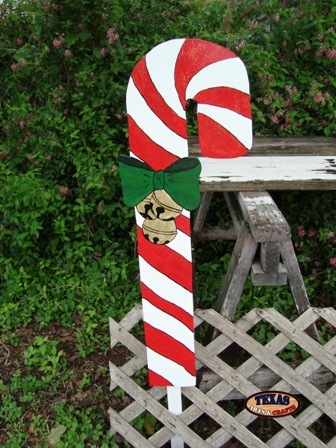 The candy cane is hand painted red and white with a green bow. The candy cane's dimensions are approximately 21.25 inches tall by 7.50 inches wide by 2 inches deep. The candy cane has a 27 inch peg. The candy cane weighs approximately 2 pounds with packaging. For the continental U.S. shipping and handling is included in the listed price. For shipping outside the continental U.S. please contact us through our Contact Us page. We build the Small Candy Cane in our workshop. The candy cane is hand painted red and white. The candy cane's dimensions are approximately 14 inches tall by 4.25 inches wide by 1.50 inches deep. The small candy cane has a 20.50 inch peg. The candy cane weighs approximately 1 pound with packaging. For the continental U.S. shipping and handling is included in the listed price. For shipping outside the continental U.S. please contact us through our Contact Us page.